Age of Conquest Version III will have a slightly modified tax and spending screen compare to Version II. 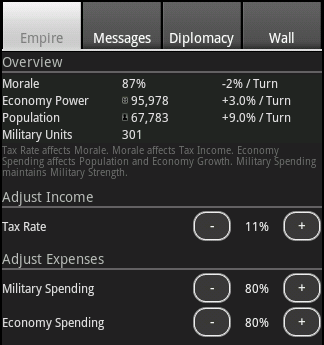 The new empire adjustment screen will allow adjusting tax rate and both military and economy spending. Tax Rate: The tax rate affects morale. A tax rate of 10% will keep morale stable. Morale is a multiplier for tax income. Keeping the tax rate low, will increase morale and yield to a higher income in the future. Keeping the tax rate high will allow for short-term tax income gains, but reduce tax income in the future due to lowered morale. Economy: Economy spending can be used to grow both population and economy each turn. Military: Military spending of 80% will keep the number of military units stable. Increasing the spending will grow military units on all the provinces each turn. Decreased spending will do the opposite. The empire screen is optional for all games and can be disabled as needed. No worries, the “old” [Recruit] button will be available as well. Military spending will be an additional way to adjust the troops number on the map. Having used the new system for a while now, it’s perfect. The best part about it is that I can tweak it to my heart’s content and get both good and bad results from my tweaks, but somebody else can leave it alone completely and still have an economy strong enough to win the game. well played.